That morning’s still-hunt, in the Year of our Lord, 1795, paused at a modest oak, a particular tree favored for both deer and wild turkey stands. Then, high up, a plump fox squirrel spiraled from the back side of a maple with a forked trunk, perhaps a dozen paces to the east of the oak where the blue jays perched. The left moccasin’s next muffled crunch marked an altered course toward the fox squirrel’s maple. Tree-by-tree and pause-by-pause the still-hunt progressed up the rise, across its crest and then just over the brow to a triangular woodland fortification created by three fallen trees, felled years apart, one atop the other. The sweet aroma of fresh turned earth mixed with the acidic bite of fermented oak leaves as a trail-worn moccasin cleared a man-sized nest in the leaves. Two squirrels, a fox and a gray dropped upon the little leaf pile. The woodsman tugged at his sash, adjusted his faded yellow linen shirt, then sat cross-legged in the dirt. He relaxed back against a barkless trunk. A Northwest trade gun rested across his blue wool leggins. His eyes surveyed the tree tops and scanned the ground for the plump fox squirrel that teased the two blue jays not all that long ago. Learning to use a re-created 18th-century artifact requires patience and diligence. The split pouch is no exception. Major Andrew Foster (1760 – 1806) provided the inspiration for the split pouch that I made for my returned white captive persona. The British officer was assigned to Fort Miami and Fort Michilimackinac from 1790 to 1795, consistent with my alter ego’s time period and location. The National Museum of the American Indian houses the Foster artifacts, including this particular split pouch. The collection page shows the pouch’s dimensions (43 by 9.5 cm or 17.2 by 3.8 inches), which were consistent with another pouch from the Lower Great Lakes region and the same general time period. My split pouch is about an inch shorter (16.5 by 3.7 inches), due to the length of a piece of deerskin I already had—“waste not, want not,” as my father always said. I had never used a split pouch for any of my traditional black powder hunts, which is one of the reasons I researched actual pouches and created a facsimile that was close in size to the original. From the living historian’s perspective, studying primary documentation, period illustrations and surviving artifacts assists with the task of approaching the total real-life experience of a backcountry hunter from long ago. In essence, I wanted to start out with a split pouch that matched 18th-century sizes made/used by “the people of the three fires,” the Ojibwe, Odawa and Potawatomi. The goal is to be as correct as possible before the first moccasin print is left in the sandy trail. All of this meticulous preparation is undertaken in the fervent hope that an intimate, first-hand knowledge of what it was really like to live in another time will emerge as those moccasin prints multiply in the course of a simple pursuit. 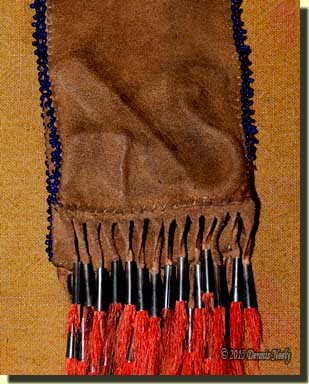 From conversations with other traditional hunters who re-enact a Native American persona, I learned that a split pouch might carry a number of personal sundries: round balls, tow, gun worms and cleaning supplies, flint and steel, tinder and char, paint, trade silver and beads, and similar small items. I think it is important to note that a common practice is to carry one’s car keys in the back half of the pouch, certainly not period-correct, but understandable. To muddy the waters further, several of the Native American re-enactors stated that their pouches were wider, one measured seven inches, but the documentation they cited is not consistent with my time period, geographical location and Ojibwe adoption. After two years of hard hunting, the flint and steel left impressions in the bottom front of the brain-tanned split pouch. A split pouch is worn over a sash or belt. The Foster pouch had quillwork on the same side as the split, which indicated that the split was worn out so the quillwork would show. To start my experiments in the wilderness classroom, I put a flint and steel in the front half and several folded journal pages and a brass lead holder in the back half. I have medium-sized hands, and right off I learned I could only use a couple of fingers and my thumb to retrieve whatever I put in the pouch. I found it easier to “pucker open” the split and tip the pouch up to allow the flint and steel to slide out, rather than try to dig for them. Using this method, I don’t have to take the pouch from my sash to strike a fire. I also have placed dry cedar bark in the front, but by the end of a long still-hunt or stalk the bark has started to break up. I haven’t tried dried grass, yet, but I expect the same results. The journal papers are another issue that falls in the category of car keys. Keep in mind that the bags and pouches carried by an Ojibwe hunter were small with little spare storage space. Plus, I doubt anyone carried four or five journal pages and a lead holder in their split pouch. Inserting the parchment pages in the pouch required “rolling” them much like rolling $50 worth of one dollar bills to fit in a bank wrapper. The pages fit snug, but at least they were the same size as the pages I keep in the trading post hunter’s buckskin envelope-type journal. And I had to “pinch” the pouch a bit to open the split and retrieve a single folded page. After two years of experimentation, the only change I might make is to add about a half inch, maybe an inch to the width, but I’m still not sold on the need for that adjustment. My overall impression is that I am under-utilizing the split pouch. There is more to learn, and I want to keep working with the pouch as it is. James Smith talks about keeping smoking supplies in his “polecat skin pouch,” in addition to a flint and steel (Smith, 31). I’m not a smoker, so that doesn’t help. But his words open the possibility of other uses that I have yet to discover, but that’s the nature of this joyous pastime. And as I stated, the journal pages do not belong in the pouch. A twined bag, worn in addition to the shot pouch, would solve the problem of limited space and provide a better place for the journal—but that is a project for another day. 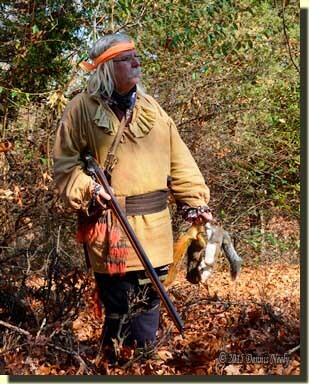 This entry was posted in Clothing & Accoutrements, Research, Squirrel Hunts and tagged Black powder hunting, Dennis Neely, historical trekking, Native captive, North West trade gun, Northwest trade gun, trade gun, traditional black powder, traditional black powder hunting, traditional blackpowder. Bookmark the permalink. I too like smaller pouches and shooting bags,(except the Trade gun match bags),that way you don’t carry a lot of excess stuff. You’d be surprised at how much you DON’T need. When trying to re-create a shot pouch based on a museum artifact, the first impression most folks have is, “Why is this pouch so small.” The old smoothbore hunters never carried much other than round balls, shot, flints, gun worms, maybe some tow and a turn screw.